No meio da semana e especiais de última hora ... verifique meu calendário. Vou oferecer a melhor taxa para o meio da semana! Fly Fishing for Trout no rio Elk é apenas a poucos minutos !!! O riacho na propriedade flui para o garfo Big Spring, que forma o rio Elk. 2 milhas a entrada do Snowshoe na base e campo de golfe .. Início Log bonita em 9 acres para alugar por proprietário. Creek com cachoeira na propriedade. 3 quartos e 2 banheiros. Jacuzzi privado! DSL Wi-Fi! Muito fácil de obter ao contrário de algumas casas na área. Acomoda 6 adultos e 2-4 crianças em beliches cheios e cama de dia (mais de 8 perderá a sua reserva). TV de tela plana de 50 polegadas com sistema de home theater. Traga o seu Ipod ou MP3 player, porque há um sistema de alto-falante para tocar suas músicas favoritas .. Grande Estilo Lareira Lodge. Enrole em torno de decks e varanda coberta. Muito privado e acolhedor. Para aqueles que simplesmente não podem fugir, temos DSL WIFI .... esperando para atualizar para Highspeed Fiber este ano. No check-in é necessário porque a sua é uma caixa de fechadura com chave e você Park à direita fora. Linhos estão incluídos em todos os aluguéis. (+ 12% Estado e County imposto sobre vendas) (+ $ 100 taxa de limpeza) (+ taxa de roupa de US $ 75) (+ $ 50 taxa de limpeza banheira quente) Nota: Até confirmada, as tarifas estão sujeitas a alterações sem aviso prévio. Atrações / As atividades são golfe, mountain bike, caminhadas, pesca com mosca. Caiaque, NRAO, Cass Scenic Railroad, rochas Seneca, Spruce Knob, Blackwater Falls e, claro, Snowshoe! Senecas Rocks e Blackwater Falls são uma boa drive mas vale a pena. De fácil acesso, mas 4 rodas motrizes ou Snow Chains são altamente recomendados durante o inverno, no caso de uma grande tempestade de neve .. Curta 10-15 minutos de carro para as pistas. Desconto de 10% off de esqui e snowboard temporada no celeiro Ski apenas 2 milhas de distância quando você livro. Até 50% de desconto nos tickets do elevador. 75 As novas ventoinhas instaladas na neve tornarão este Inverno fantástico! Excellent stay! Highly recommend this property! 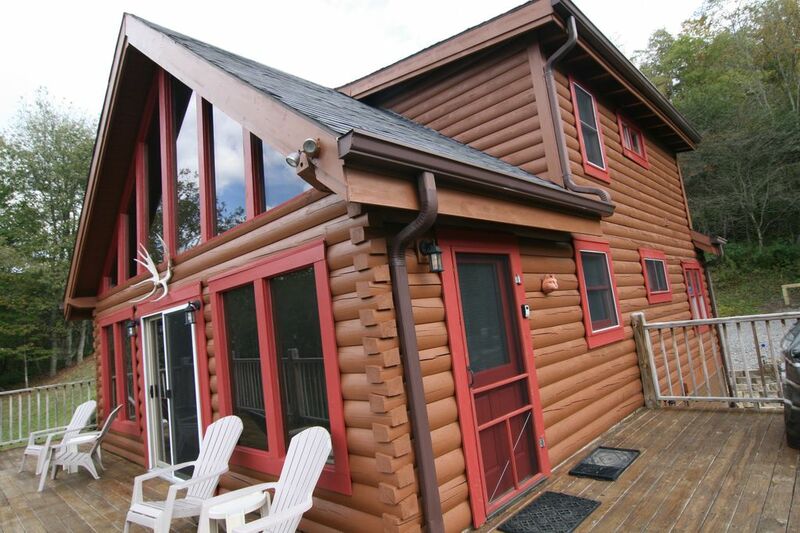 Peaceful, well equipped cabin, close to the resort......highly recommend! Glad you had a great time and enjoyed the cabin and the area. TIPS: We brought all of our own food and didn't plan to go to the store. We also brought extra towels for the hot tub. We purchased firewood but didn't need to - there was plenty. The kitchen is nicely equipped for all your basic needs. We brought extra toilet paper and paper towels as he suggested, as well as paper plates and trash bags. There are plenty of outdoor chairs - no need to bring any. There's also an outdoor fire pit, which was a pleasant surprise! NOTES: The flu in the fireplace had issues, but we were able to crack a window and keep it from smoking the house. I guess it has something to do with air pressure when it's windy. There is no cellular service and very limited wifi, but that's what we wanted. A chance to disconnect! We were very disappointed at first to discover that all events and restaurants at Snowshoe were closed the month we were there - the pool, golf, range, horses, etc - but in the end, we are glad we didn't have to leave the cabin. But you want to check if it's the fall or spring! I'm glad we didn't pack our golf clubs. Loved the house and its property! Three of us spent four nights at Moose Lodge in early October. Although too early to see the beautiful colors, the view was still spectacular. We arrived after dark, and you can imagine our surprise to wake up to a wall of windows with gorgeous view -- from our bed! Although, we recommend highly NOT arriving after dark because we had some difficulty finding the house in the woods. We took advantage of everything -- especially enjoying the hot tub, fire pit, and the fire place in the living room. The home is clearly loved by its owner. We recommend the Cass Scenic Railroad, which we enjoyed very much, and driving to the top of the mountain where Snowshoe resort is. Wish we had planned our trip a few weeks later because I can just imagine the view from Moose Lodge. There's always next year! Cabin is secluded and that's what we like. We saw a bear and multiple deer while we stayed at the cabin. The owner was very helpful when needed. A great place to sit back and unwind. Beautiful views of the mountain. Don’t miss the hike up to the falls - amazing! My wife and I spent a week at Moose Lodge. The property was as advertised and we enjoyed our time spent there. The view from the deck of the mountains was beautiful. The house is spotted to take full advantage of the view. Star gazing at night was a highlight for my wife. We visited in the off season but the house is located close to Snowshoe Resort. Desfrute Snowshoe para suas atividades ou apenas um passeio em torno Pocahontas County. Há muito o que fazer / ver sem mesmo indo para Snowshoe.